WP Twin Review. Do Not Buy WP Twin! Below you’ll find description of most significant differences from the user perspective between WP Twin and Backup Buddy, if you want to see detailed feature by feature comparison between the two click here. If you want to see why BackupBuddy is considered the best WordPress backup plugin check out BackupBuddy review here. With WP Twin you can save backup file to the same server or download it to your computer. By default you can only do manual backup which is not that convenient if you have a lot of other things to do. If you want to backup your blog automatically using WP Twin you have to purchase another script from them for $47. With Backup Buddy you can perform automatic backups on the schedule that you define – every hour, every day, every week… and then send those backup files to secure remote destination like Amazon S3, DropBox, Rackspace Cloud, FTP/FTPS this way you can restore your blog even if you lose access to your server. This happened to me when my hosting account got permanently suspended for “excessive resource usage” and I wasn’t able to access backup files stored on my server. With BackupBuddy if you have enabled scheduled remote backups script will backup your blog as often as you want, you could backup every hour if you feel a need, this way in case something happens you would have backup copy of your blog that is hour old and don’t lose any data. With WP Twin when migrating your website to a new domain you have to install WordPress there first and only then script will import your database and all the files. This seems like extra work to me and can consume valuable time if you don’t have 1 click WordPress installers like Fantastico on your hosting panel. 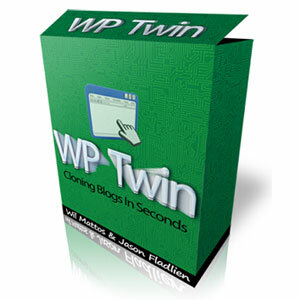 Other than that cloning WordPress blogs with WP Twin is fast and easy. When migrating blog using Backup Buddy you don’t have to install WordPress on the destination server it will be created automatically with all your files and settings. If your primary goal is to clone WordPress sites and you need simplicity without advanced features then WP Twin will do the job. But if you’re looking for complete solution for WordPress backups that has all the bells and whistles then BackupBuddy is the right tool for you. There is nothing as good as as WordPress twin for a web designer who works on test sites all day for clients and than to be able to just clone it to install it is amazing. What used to take me 3 hours to move a site and launch it now only takes me 20-30 minutes total. I love WP Twin. I use other programs to back up websites all the time. I have not tried Back up Buddy and I am sure it is good, but I have been using WP Twin for over 2 years now and I am very happy.